The solar atmosphere is filled with various types of heating and dynamic phenomena. These include the dynamo mechanism that creates the magnetic field, magneto-convection and MHD waves that transport energy via magnetic fields, MHD instabilities that result in large-scale explosions like flares and CMEs, and magnetic reconnection that transiently dissipates magnetic energy. All of these are physical mechanisms that work ubiquitously in the universe, and they have all been extensively studied in laboratory experiments and theoretical investigations. Recent space-borne observatories such as Hinode, SDO, and IRIS have been providing high spatial resolution observations of dynamics in the solar atmosphere. New advanced facilities will also start their observations in the coming years. The 4-m aperture DKIST will have first light in 2019. Parker Solar Probe has just been launched, and together with Solar Orbiter, to be launched in 2020, will investigate plasma in the solar atmosphere by making a close approach to the Sun. At the dawn of this new era, it is important to review recent observations by Hinode, SDO, IRIS and all other observatories, recent progress in space and laboratory plasma physics, and to have stimulating discussions on the future direction of laboratory and space plasma research. 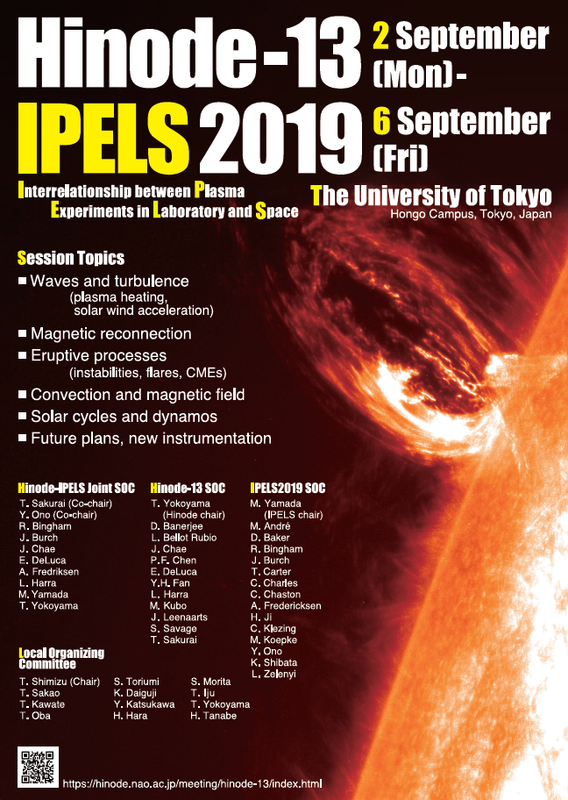 This is a joint meeting combining the 13-th symposium of the Hinode mission with the 15-th symposium of IPELS (Interrelationship between Plasma Experiments in the Laboratory and in Space). An abstract submission and registration sites are now available. Please visit Registration to make a registration and submit your abstract for the Hinode-13 / IPELS 2019 meeting.